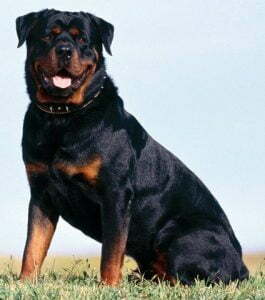 Last Saturday, January 12, an eight-year-old Rottweiler named Buddy was faced with a scary sea situation at Langstone Harbour in Hampshire. Buddy was frolicking on the beach throughout the afternoon, but soon found himself in a spot of difficulty when the tide began to rise. As the water inched closer, mud on the beach became soggier, resulting in the dog getting trapped. When a passer-by noticed that the mud was covering the dog’s chest, a 999 call was made to the Solent Coastguard. Despite the owner’s attempts to rescue the dog, assistance from a coastguard rescue team was necessary. The team arrived in the nick of time, as the creek began swelling with the rising tide. A group of rescuers pulled the uninjured dog from the water, placed him on a stretcher and brought him onto dry land. Although exhausted and cold, the animal was unharmed and reunited with his owner immediately. Langstone Harbour is snuggled into the heart of a dynamic urban area, and is a popular tourist destination. This seaside area is part of Hayling Island, features a number of walking routes and appeals to dog walkers from the local area. Fierce tidal rips entice boating and jet ski enthusiasts but, as this scare shows, it is always strongly recommended to check the tides before taking to the water. 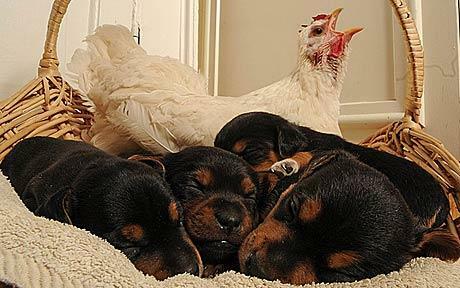 A chicken named Mabel has taken its love of extreme sports to the max, and has adopted a litter of Rottweiler puppies. This it did after losing a fight with a horse that resulted in it injuring its foot, causing its owners to allow it to sleep inside the house – where it found the puppies. Mabel, and her puppies, live on a farm in Shrewsbury. Mabel keeps her new charges warm by ‘sitting’ on them while they are asleep in her basket. Mabel is dicing with death because the puppies aren’t actually orphans; they have a mother named Nettle. Mable waits for Nettle to leave them before entering their basket and sitting on them. The owners of the courageous chicken, and the Rottweiler puppies, are Ros and Edward Tate. Mabel was hatched here about a year ago. She would have gone onto someone’s dinner plate but we saved her and brought her into the house. Unfortunately, she got into an accident with a horse, which accidentally trod on her foot. Because of that, she gets terribly cold during the winter so we decided to bring her into the house. In the Bolton News today, an 11 month old puppy called Ernie is being hailed as the ‘Wonder Puppy’ after his amazing escape from a fire in his home. Ernie is an 11 month old Rottweiler and when a fire broke out in the cooker in his terraced home’s kitchen in Tonge Moor, the dog jumped over a child’s safety gate, nosed open the upstairs window and jumped 12 feet to the ground to escape the blaze. A rottweiler has adopted his young pal, an eight week old wolf, since she was rejected by her parents at only a few days old. 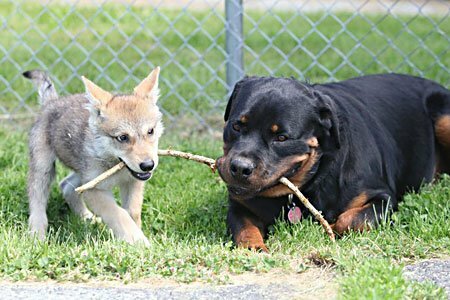 Pictured here sharing a stick is the eighteen month old Rottweiler Ulrok and his companion Beldaran, a young female wolf. The loyalty of dogs is second to none, and tales of dogs refusing to leave the side of their owners, even when they have died, are commonplace. However, for two dogs and their owner, the dogs’ loyalty proved a problem as they were preventing emergency services from reaching the stricken dog owner. Sixty-two-year-old Gerald Mitchell had collapsed in an industrial estate in Workington, Cumbria. 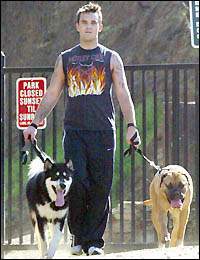 His two dogs, both Rottweilers, stayed by his side and protected him from any passersby, which included the police and emergency services.